I'm on a total cupcake kick. I got the Martha Stewart Cupcakes book recently and was totally hooked. If you love to bake, this is a must have for your cookbook collection. I judge a cookbook by how many recipes I actually use out of it. So far, every recipe has turned out wonderfully. I keep going back to it. Cupcakes are generally great because they are small and there's really no guessing on the portion size. The book also has some great recipes for icings. I'm not big on icing or frosting on cakes. I like a nice glaze, but for me...the best part is the cake. The less sugary frosting, the more cake I get to eat. The exception being Costco Cakes: white cake, cream cheese icing, with cheesecake filling...and it has to be cold. 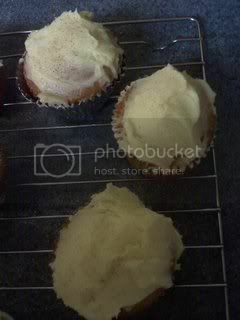 There is a great blog featuring the Martha Stewart Cupcakes. This month, the group made Snickerdoodle Cupcakes. My little Fabulista (formerly The Terrorist, but she's turning 4 and isn't so terrorizing anymore), has started referring to herself as Little Chef and me as Big Chef. She wanted to help me bake cupcakes. How could I say no to this face? She loved helping me scrape down the sides as we mixed. I try to give her all sorts of jobs that are kid friendly but can't mess up the finished product. Also important to remember to have things pre-measured so you don't end up with too much...say salt...or mixing up the amount of baking soda vs baking powder...or forget how much flour you've added already. Not that any of that has happened to me (recently)! Of course one of the best parts about baking with mom...Eating the beaters. As I said before, I'm not a big frosting person. Leelee made cupcakes a few days before. We were out of frosting and she made the fluffy vanilla frosting from Martha's book. This keeps pretty well in the fridge and after a few days, is the same consistency as frosting in a can. According to Martha, one batch of frosting is enough for one batch of her cupcakes. For our family, it's enough for 3 batches. We just reused that frosting for this recipe. Even tho it wasn't the light and fluffy variety that is suggested for the snickerdoodle cupcakes, it was still delicious! Don't you love mother-daughter baking days? 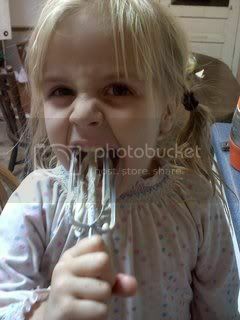 I love the beater-licking photo! 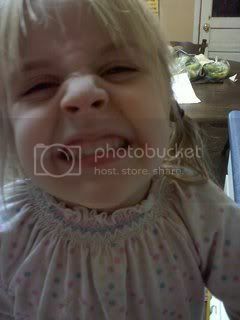 Your daughter is adorable. I also made fluffy white frosting and thought it worked well. They look great! And it looks like your daughter had a great time helping. 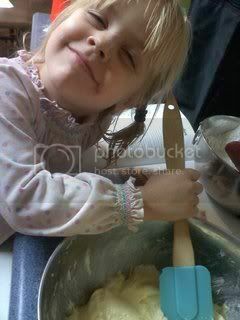 My daughters both love to help bake, too, especially when it comes time to "clean" the beaters and bowl! How fun to bake with your daughter! I have great memories of baking with my son! This was a great recipe. My idea of Snickerdoodle Cupcakes is a nice yellow cake mix with a heaping teaspoon of strong cinnamon sugar sprinkled over the batter before you place them in the oven. Try it next time you need a cake but have no frosting ingredients. It makes a nice light cupcake and doesn't need any frosting. This is a throwback to the unfrosted cinnamon sugar sprinkled cake they used to serve in my high school cafeteria in the 70's. What a sweet little helper you have! Thanks for baking along with us this month! What a cute little bakery chef!